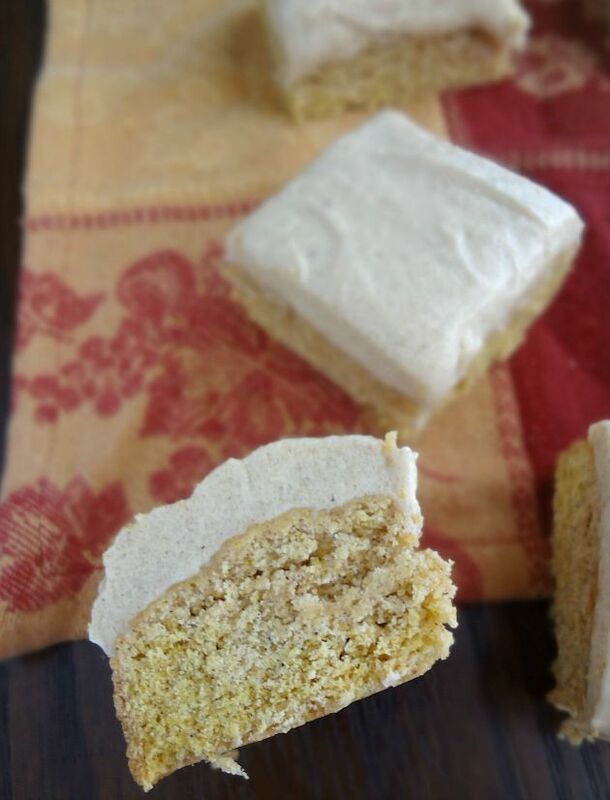 I made these pumpkin bars for 100% unselfish reasons. I made them for Michael's boss, my brother, and you. See....I may have mentioned it before but Michael and I pretty much despise all things fall. We do not like this season. And one of those things includes people pumpkin-ing all the things. Mind you, I enjoy a nice piece of pumpkin pie at Thanksgiving but aside from that...no pumpkin for me, thanks. But then Michael's new boss made a request. And my brother (who is leeeaving for the airforce in a couple months!) was all "oooh yeah!" and I thought to myself..."The readers will want this." I made these. You're welcome everybody. First let me explain what I made. 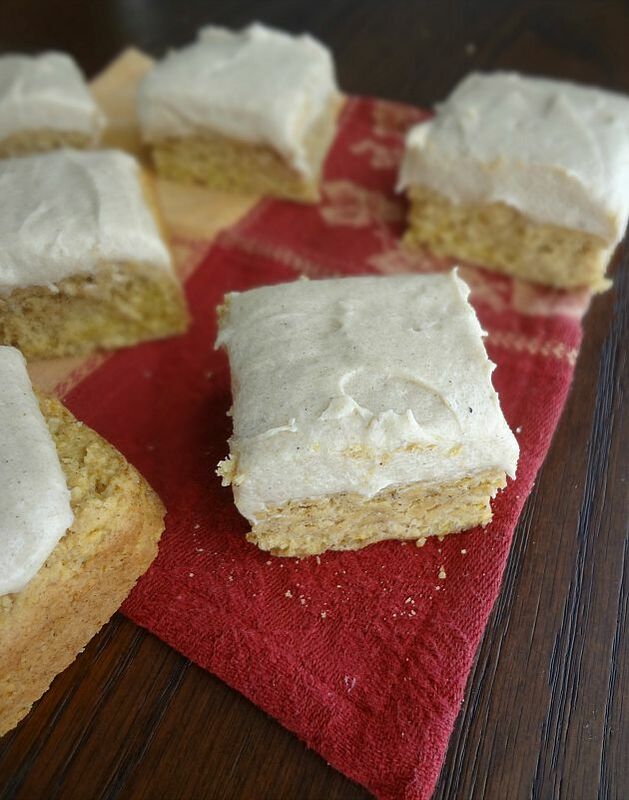 These are a spiced pumpkin sugar cookie bar (which I made even more pumpkin-y with the addition of pumpkin spice flavored butter that I had) that are then frosted with a brown sugar cream cheese frosting (which I, again, amped up with that pumpkin butter). Josh: "I was expecting them to be gooey but I really like them-the pumpkin flavor is just enough." You (probably): OMG I LOVE THEM YAYYY PUMPKIN ALL THE THINGS! Makes one 9x9 or 8x8 pan. Preheat oven to 350F degrees. Lightly spray a 9"x9" or 8"x8" inch baking dish with non-stick cooking spray. In the bowl of a stand mixer (or with an electric hand mixer), cream together butter and sugar. 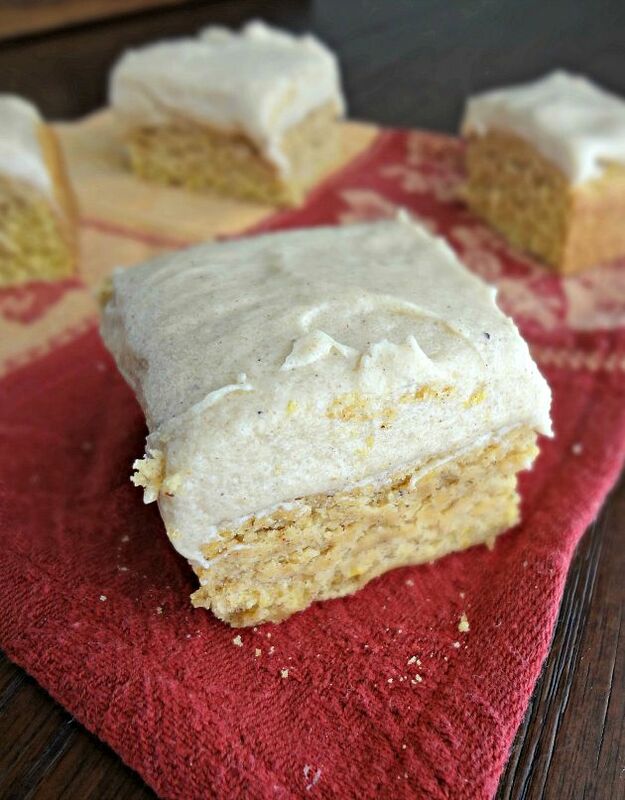 Beat in pumpkin, egg, and vanilla extract until creamy. In a separate bowl whisk together flour, cream of tartar, cinnamon, nutmeg, ginger, baking powder, baking soda, and salt. Add dry ingredients to wet ingredients and mix until just combined. Press dough into the bottom of the prepared baking pan. Bake for 15-20 minutes, until slightly golden around the edges and the middle seems cooked through. Move pan to a wire rack to cool completely (will probably take a couple hours). 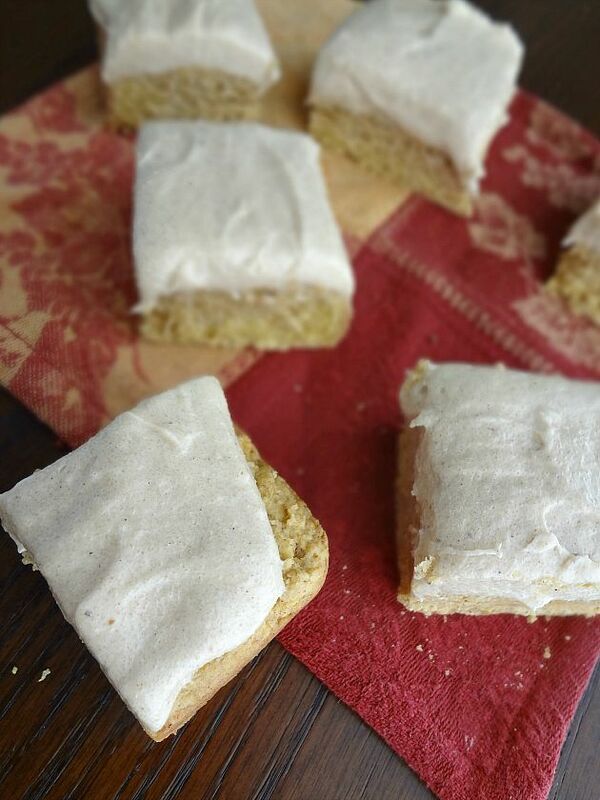 While bars are cooling, prepare frosting. With an electric mixer (stand mixer with paddle attachment or a hand mixer is fine, too) beat cream cheese for about 1 minute, until soft. Scrape sides of bowl and add the butter-beat on medium speed for about 1 minute, until combined. Beat in brown sugar and molasses for about 30 seconds. On low, mix in the sugar and salt, and then the vanilla until just barely combined. Scrape the sides and bottom of the bowl. Beat on medium speed until the sugar has dissolved and the mixture is soft and smooth. Spread over cooled bars. Cut into pieces (for an easier time cutting and serving, you may want to refrigerate to allow the frosting to firm up a bit). Store leftover cookie bars in an airtight container at room temperature for up 2 or 3 days or in the refrigerator for up to 5 days. They're pretty and smell good, I'll give you that.